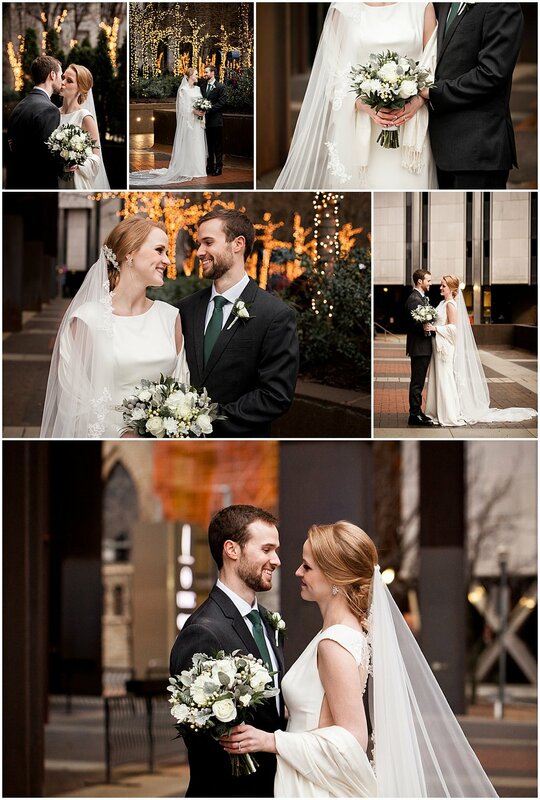 Miranda+Kevin’s January wedding at Phipp’s Conservatory in Pittsburgh was an intimate day surrounded by close friends in the natural flora setting. Miranda who is originally from Canada was attending Slippery Rock University. During this time Kevin and Miranda met randomly while they were both attending the Pittsburgh Three Rivers Art Festival. After they began talking, they found out they were only living twenty minutes apart and quickly fell for one another. Kevin gets a ton of credit for creating one of the sweetest proposals. Miranda prefaced this story with “Kevin doesn’t cook”. One morning while Miranda was sleeping Kevin got to work in the kitchen. He set out to make mini pancakes and used chocolate sauce to write on them. On eight tiny pancakes surrounded by strawberries he spelled out “Marry Me?” He took everything into the bedroom where Miranda was still asleep. He then enlisted the help of their cat Percy to wake Miranda up, by telling her Percy had something to show her. When she sat up and opened her eyes the proposal was spelled out in front of her. Miranda was in total shock but once she realized she wasn’t still dreaming, said yes! Miranda and Kevin didn’t want to take away from the natural beauty of Phipps and chose to keep the details simple and chic. There were tea candles lit throughout the space creating romantic vibes. To keep with the natural theme, the table favors included seed packets with words “let love grow” on them. 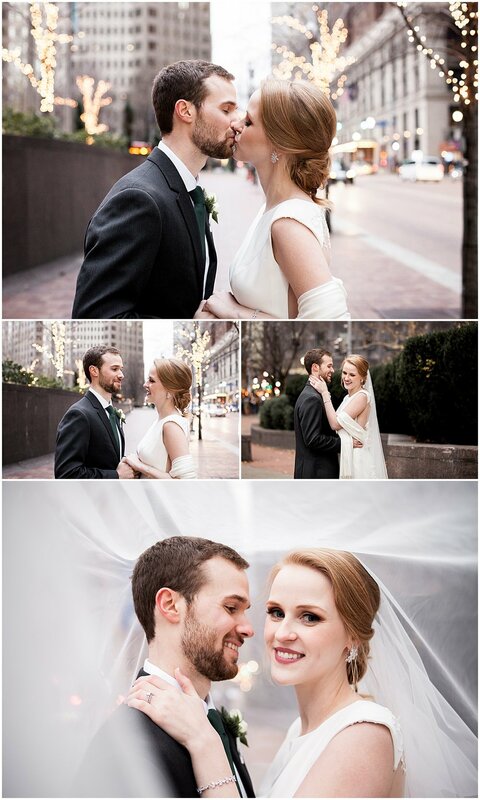 Miranda wore gorgeous lace embroidered dress while Kevin was dressed in a traditional suit with a fun floral bowtie. The bridal party wore deep purple dresses while the guys wore black suits incorporating the purple with their ties. Miranda and Kevin are such sweet and quirky couple and their wedding day was the perfect way for Jp and I to start off our 2019 wedding season! We have so much gratitude to have been a part of this joyful day, here’s to wishing Miranda and Kevin all the best as they embark on this wonderful journey! A planner will work with you from start to finish. They keep track of all of your vendors and correspond so you don’t have to. A planner will assist with scheduling. They will be knowledgeable in when you should book vendors and when to schedule certain consults or run throughs, such as cake tastings. Planners also relieve your stress on the day of your wedding by coordinating events and vendors to ensure everything runs smoothly. You may think hiring a wedding planner might be too expensive or cut into your budget too much. However, a wedding planner can actually save you money in the long run, by helping you budget accordingly. Even though you may have an idea of how much you want to spend, a wedding planner can help you break it all down. They will handle managing the overwhelming spreadsheets and will show you realistically what to expect to spend for each area of your wedding. In addition to breaking down the numbers, a planner can at times get vendor to vendor discounts/referral codes to help you save even more; being that they often have strong relationships with other vendors in your city. It can be difficult to get every detail right when you’re trying to plan a wedding all on your own. From flowers to decor and everything in between, trying to execute your dream wedding on your own can end up turning more into a nightmare. A wedding planner’s job is to ensure every detail of your vision is brought to the table on your big day. Let your wedding planner be a wedding perfectionist and know that everything will end up even more beautiful than you could have imagined.